From Madrid to Mexico to Manila, the Spanish Crown had the one of the first empires where the sun never set. From the fall of Granada to the Dutch Wars of Independence, Spanish power always had to be taken into consideration. But its road to dominance ran through local rivals like Portugal and Morocco, and its control over the vital sea routes was challenged by English navies and ruthless privateers. What path will you take? 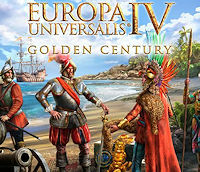 Europa Universalis IV: Golden Century is the newest immersion pack for Paradox’s classic game of empire and exploration in the early modern era, and it is available today on Steam, the Paradox store and other major online retailers for $9.99 / £7,15 / €9,99. Golden Century is accompanied by the free Spain update, available to everyone who owns Europa Universalis IV. This update will include newly detailed maps of Iberia, North Africa and the Spanish Main, as well as revised National Ideas for many nations in the Western Mediterranean, new Government Reform options and other changes for all players. Watch the Europa Universalis IV: Golden Century Release Trailer HERE. In 1488, the Portuguese explorer Bartolomeu Dias rounded the Cape of Good Hope, discovering a sea route to India and opening up the Indian Ocean for European trade. Over the succeeding centuries, merchants and adventurers would follow this route to lands rich in spice and silk. Diamonds as big as your fist decorated the thrones of dozens of princes ruling over millions subjects. The foreign traders would make themselves masters of this land. Will you? Paradox Development Studio is happy to announce the release of Europa Universalis IV: Dharma, the latest expansion to its celebrated grand strategy game of exploration and high politics in the early modern era. Dharma brings a host of new systems and game options to EU4, with a focus on the Indian subcontinent. It is available now for $19.99 on Steam and the Paradox Store. Watch the Europa Universalis IV: Dharma Release Trailer HERE. A new Content Pack is also available, adding new Indian army models including war elephants, dozens of new advisor portraits and over ten minutes of new original music. Dharma’s release coincides with the Mughals update, free for all Europa Universalis IV players. This update includes a more detailed map of the Indian region, a renewed Estate system, and a new approach to Policies. The riches and intrigue of Indian politics are the focus of Europa Universalis IV: Dharma, the newest expansion to Paradox Development Studio’s classic historical grand strategy game. Will you defend the subcontinent against foreign commercial empires? Can you set up a European trading empire in one of the richest lands on the globe? You will get your chance to build a new world-spanning empire on 06 September, 2018, less than a month from today. You can watch the Europa Universalis IV: Dharma – Release Date/Story Trailer HERE. A hundred and fifty million souls speaking dozens of languages stand between European traders and unimaginable wealth. Diplomacy, war and subterfuge will be used on both sides to either preserve the power of the Mughal emperor and his dependents or to undermine that throne. Unite the Indian people, or divide and conquer. You write the history in Europa Universalis IV: Dharma. Europa Universalis IV: Dharma will be available later this year for a suggested retail price of $19,99. Click here to view the Europa Universalis IV: Dharma announcement trailer. Rule Britannia brings greater depth to the lands of England, Scotland and Ireland while offering tools that will deepen the experience of Europa Universalis IV no matter where you choose play. The mission system has been completely reorganized (with new unique missions for the British and Irish nations), and any nation with a fleet can choose a naval doctrine that will boost its galleys, reduce its maintenance cost or strengthen the power of its trading ships. Paradox Development Studio will release the newest add-on to the historical grand strategy classic Europa Universalis IV on March 20. Rule Britannia is an immersion pack that adds greater depth to the British Isles while adding new content for every nation including new approaches to technology and the early industrial revolution. In Rule Britannia, players will have the chance to push their late game economy to even higher levels through the discovery of coal. Highly developed provinces in some regions will discover this precious resource, allowing rulers to build furnaces that improve goods production across the country. New Unit and Music Packs: Our artists and composers have new treats for Rule Britannia players, including new army designs for British and Irish nations (including Northumberland and Cornwall) as well as new music to set the mood. Europa Universalis IV: Rule Britannia will be available in the Paradox store and on Steam on March 20 for the suggested retail price of $9.99. Great empires look ahead. Keep your traditions in mind, yes, but the past should be a guide, not a fetter. Break from the old faith. Break from centuries of squabbling on the continent. Break from old modes of production. Stride boldly into a future of new science and power guaranteed by our sails, backed by our army. Rule Britannia. Rule Britannia is a new immersion pack for Europa Universalis IV. Immersion packs are designed to add greater depth and focus to the historical legacy of a particular region and Rule Britannia takes the history of the British Isles as its priority. Watch the Europa Universalis IV: Rule Britannia – Announcement Trailer HERE. Trade Steering: Force your defeated enemies’ merchants to fill your coffers. You can pre-order Europa Universalis IV: Rule Britannia via Paradoxplaza.com. Paradox Development Studio announces that Cradle of Civilization, the newest expansion to its flagship grand strategy game Europa Universalis IV, will be available to all wannabe conquerors on November 16, 2017. In less than a month, the million-plus explorers, traders and conquerors that make up the Europa Universalis community will see deeper gameplay and more detailed modeling of the tumultuous Middle East and Central Asia. Cradle of Civilization will come with a host of new features, centered on the great empires that rose and fall in the fertile valleys that stretch from the Nile to the Indus. But let’s listen to Europa Universalis IV Game Director Jake Leiper-Ritchie outline the exciting changes in this developer video. Cradle of Civilization continues the Paradox Development Studio mission to explore and explain the world beyond most textbooks, giving many great societies their chance to shine and open new and exciting ways for players to experience the early modern era. Europa Universalis IV: Cradle of Civilization will be available for the suggested retail price of $19.99. For more information, please visit the official Europa Universalis IV website. Paradox Interactive and Paradox Development Studio today announced Europa Universalis IV: Cradle of Civilization, a new expansion to the best-selling grand strategy game about exploration and empire in early modern history. For millennia, empires have battled over the deserts and valleys where humankind once took its first tentative steps towards to something larger. From Sennacherib to the great khans, the crossroads of trade and learning have also been the highways for armies and warlords. Now, in the shadow of the collapse of Timur’s great empire, new powers are staking their claim to be the heirs to the Cradle of Civilization. Europa Universalis IV: Cradle of Civilization adds greater depth to the Muslim nations that occupy the lands between the Nile and the Indus. With new governmental powers and game options, the major powers of the region will each feel even more distinct from each other. Mamluk Government: In a diverse empire, where the slaves are now masters, new sultans must rely on cultural power to stay viable. Persian Theocracy: Persian nations can use the power of the faith to bolster their regime. Tribal Federations: The Black and White Sheep tribes in Armenia and Mesopotamia must expand to exploit the unity of local clans. Army Professionalism: The Age of Mercenaries slowly transitions to the Age of Standing Armies as you recruit new generals and drill your peacetime army. Iqta Taxes: Muslim governments can impose new taxes every 20 years for special bonuses. Trade Policies: Instruct your merchants to take actions in trade nodes to increase your trade power or military advantage. Islamic Schools: The wide range of Sunni and Shia disciplines offer unique perks to their disciples and transforms international relations across the Middle East. And Much More: The Cradle of Civilization expansion will be accompanied by a free update for all EU4 players, including a new map with many new nations. Cradle of Civilization continues the Europa Universalis IV tradition of letting players explore new histories and cultures, giving starring roles to empires often forgotten in textbooks. Cradle of Civilization will be available in late 2017 for the suggested retail price $19.99. Watch the Europa Universalis IV: Cradle of Civilization Announcement Trailer HERE. Paradox Interactive, a publisher and developer that’s never rushin’ out its games, today released new content for two of its best-selling Grand Strategy games, both focused on the nations of Eastern Europe during different, formative periods in history. Third Rome, a new immersion pack for Europa Universalis IV, adds new gameplay features for the Russian empire, and is available for $9.99. Death or Dishonor, a new country pack for Hearts of Iron IV, brings new events and national focuses to the nations bordering the Soviet Union during World War II – Romania, Czechoslovakia, Hungary, and Yugoslavia – and is available as well for $9.99. The two packs can also be purchased together in a discounted bundle for $17.98. Both packs are available today for Windows, Mac, and Linux PCs. Equipment Conversion: Update your arsenal by converting older units — or make use of captured enemy vehicles and gear. New Diplomatic and Puppet Interactions: License military technology to bring other nations’ weapons to the field or sell your advances to the highest bidder. Players can purchase Third Rome and Death or Dishonor together here via Paradox Plaza.